The 10th Judicial District Commission on Judicial Performance unanimously recommends that Judge David L. Lobato BE RETAINED. Judge Lobato was appointed to the Pueblo County Court bench in February of 2012. Judge Lobato was a Deputy State Public Defender in El Paso and Pueblo Counties prior to his judicial appointment. 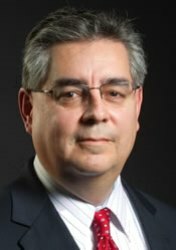 Judge Lobato received his undergraduate degree from the College of Santa Fe in 1982, he received a Bachelor of Sacred Theology degree from the Pontifical Gregorian University in Rome, Italy and he studied moral theology at the Pontifical Alfonsian Academy in Rome from 1985-1987. Judge Lobato received his law degree from the University of Colorado in 1994. Judge Lobato handles both a criminal and civil docket. The commission considered results from the Judicial Performance Survey, interviews with representatives from the District Attorney and Public Defender’s offices, as well as extensive courtroom observations, written opinions, and his individual interview with the commission. Of attorneys responding, 94% recommended to retain, 2% recommended not to retain, and 4% made no recommendation. Of non-attorneys responding, 88% recommended to retain, 3% recommended not to retain, and 8% made no recommendation. Judge Lobato was consistently commended for his judicial temperament. His calm and even demeanor extends to all parties in his courtroom. Judge Lobato is fair in his treatment of attorneys. He is willing to listen to the parties and he makes fair and balanced decisions based on the merits of the case. Judge Lobato has an excellent understanding and knowledge of the law and is consistent in his rulings. He starts his dockets in a timely manner and is efficient. Judge Lobato also takes the time to mentor the lawyers, who appear before him, by offering feedback. The Commission believes that while the survey evaluation results were overwhelmingly positive, Judge Lobato still continues to be self-reflective and seeks ways to improve. He is respectful, shows compassion, and has provided for a well-run courtroom in which people feel comfortable.